Oakland, CA - February 26, 2016: The Oakland International Airport (OAK) has unveiled eight new BorderXpress Automated Passport Control (APC) kiosks to improve efficiency for its international travelers. The installation of APC kiosks will greatly expedite the customs entry process, requiring no pre-registration or cost to the passenger. Use of the self-service kiosks will expedite the border clearance process, resulting in shorter waits for travelers, fewer missed connections, and cost and space savings for OAK. The new kiosks represent a self-service border control solution that accepts all passports from approved countries and does not require pre-registration or fees. Eligible passengers choosing to use the new kiosks can proceed directly to a self-service kiosk in the border area and complete a two-step process. STEP 1: Travelers complete the data-entry function themselves at the kiosk, which sends their encrypted information to the Customs Border Control agency that assesses the data and returns a government response in seconds. STEP 2: With receipt in hand, travelers proceed to a border control officer who verifies the document. A border officer will always have the final approval to allow a traveler into the country. By automating the administrative portion of the customs declaration process, BorderXpress APC technology helps speed up the U.S. Customs and Border Protection (CBP) process by up to 89 percent, as reported by some airports with the devices. With this increased efficiency, international travelers arriving at OAK will experience shorter wait times, less congestion and faster customs processing times - all without having to add additional space or staffing resources. This technology was developed by Innovative Travel Solutions, an independent business unit within Vancouver International Airport (YVR) with more than eight years of experience in kiosk design, kiosk user experience, kiosk layout, flow analysis and continuous improvement for automating border control systems at airports across North America and around the world. "We are thrilled to partner with the Port of Oakland to improve the international travel experience for passengers flying through OAK," said Craig Richmond, President and CEO, Vancouver Airport Authority. "BorderXpress provides a quick, easy and secure alternative to the traditional full clearance with a U.S. Customs and Border Protection officer by partially automating the inspection declaration process, cutting wait times dramatically. As a result, both Oakland Airport and its passengers walk away happier knowing they're receiving the best and most efficient service available today." For those accustomed to traditional customs procedures, the changes will be noticeable. 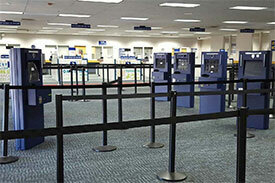 Instead of filling out a declaration card and taking travel documents to a CBP officer, eligible passengers choosing to use APC can proceed directly to a self-service kiosk in the U.S. CBP customs-control area. Eligible travelers include U.S. and Canadian passport holders, U.S. Permanent Residents, and eligible international travelers with Electronic System for Travel Authorization (ESTA) approval from 38 countries not requiring U.S. entry visas, including Norway, Sweden, Australia, Japan, Germany, the United Kingdom, and many more. Travelers then follow the on-screen instructions to scan their passport, use the touch screen to answer the customs declaration questions, receive a receipt confirming their information, and proceed to the CBP officer to finalize processing. The addition comes as the Airport undergoes renovation of its Terminal 1, several new route announcements, an 8.4% increase in annual passenger traffic, and the introduction of new amenities. Port of Oakland Acting Director of Aviation, Kristi McKenney, applauds the addition as an important positive step continuing to improve the travel experience for OAK customers, "Oakland is very much focused on continually improving the travel experience for our customers. We are excited to have expanded our flight service to Stockholm, Sweden, and Oslo, Norway last year, and will launch new service to London-Gatwick in May. The new BorderXpress APC equipment has a track record of improving efficiency at the airports where it currently exists, and we look forward to this service to our customers." Oakland International is the fourth largest airport in California and second largest in the San Francisco Bay Area. With over 11 million travelers each year, OAK is the closest airport to the region's top tourism and entertainment venues. It is also the closest for most local residents. The airport now offers air service to 53 destinations on 13 different airline brands – seven of which operate with OAK as their sole gateway into the San Francisco Bay region. For up-to-the-minute departure and arrival information, airport maps, and details on shopping, dining, transportation, and more, visit www.oaklandairport.com. Vancouver Airport Authority is a community-based, not-for-profit organization that manages Vancouver International Airport (YVR). Canada's second busiest airport, YVR served 20.3 million passengers in 2015. Fifty-six airlines serve YVR, connecting people and businesses to more than 118 non-stop destinations worldwide. YVR was voted Best Airport in North America for the sixth consecutive year, and Best Airport in the World for its size category of 10-20 million passengers, in the 2015 Skytrax World Airport Awards. Vancouver Airport Authority is a dedicated community partner and in 2015 donated more than $990,000 to local organizations. We are committed to creating an airport that British Columbia can be proud of: a premier global gateway, local economic generator and community contributor. For more information, please visit www.yvr.ca.